These root-eating larvae of the scarab beetle family include Japanese beetles, June bugs, rose chafers, and the black turfgrass ataenius. Grub size and characteristics vary, but grubs are generally plump, whitish gray and C-shaped with brown heads, and three pairs of legs. In the summer, you can identify adult Japanese beetles, metallic green with copper wings, and June bugs, reddish brown nocturnal fliers. Wilted, bluish-gray grass that appears as drought damage in late spring then becomes dried and browned-out turf later in the season. With the roots eaten, the turf will roll back when pulled on. Once soil heats up to 60° Fahrenheit in spring, you will find grubs in the top few inches of dirt. Unless the grass is already in poor condition, control is usually not necessary until you have 10- to 15-grubs per square foot. Before using milky spore disease to combat Japanese beetle grubs, check with your Cooperative Extension Service (CSREES) to see if the spore is effective in your area. Studies indicate that milky spore, especially in colder climates, is less effective than previously thought. Because the beetles prefer moist soil for laying eggs, one tactic is to water deeply, but infrequently, during the summer. White grubs are also susceptible to parasitic nematodes such as Steinernema carpocapsae. If damage warrants reseeding, turning over the soil and either handpicking out the grubs or leaving them exposed for birds may serve as a short-term alternative. 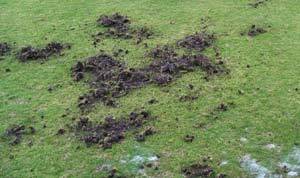 A lawn attacked by grubs will have patches of dead, dying, or wilted grass. However, if injury is moderate, the lawn may recover. The C-shaped, small white larvae of this weevil causes more damage than the adult does. Found more commonly in northern states, billbugs prefer Kentucky bluegrass, feeding on stems, crowns, and eventually roots. Irregular dry patches the color of whitish straw that develop by midsummer. When you tug affected grass, it breaks off at the root line, exposing hollowed-out stems packed with sawdust-like material. Unlike grub damage, the turf will not feel spongy. You may note some of the legless larvae underground. Nematodes are showing promise for this difficult-to-control bug. Try using insect-resistant bluegrass varieties (i.e. Park, Arista, NuDwarf, and Delta), or endophyte-enhanced ryegrass and fescues. For spot treatment, use Rotenone, a botanical insecticide. 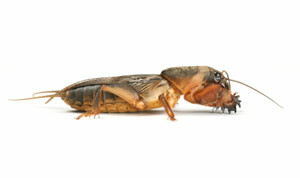 A mole cricket is a root feeder. It prefers light, sandy soils, and leaves brown, dry patches of turf in its wake. These large crickets with short, stout forelegs feed on grass roots and tunnel through underground root zones. Especially damaging pests in the light, sandy soils of the southern and Gulf plains, they prefer bahiagrass, but feed on whatever grass is available. Small tunnel openings and spongy earth along with browned, dry patches of turf. Use a soap drench and observe for three minutes. Finding two to four crickets per 4-square feet is significant. Follow practices to encourage deep roots and to keep thatch low. Use low-nitrogen fertilizer to avoid developing overly succulent growth, and mow high. Research done at the University of Florida has shown promising results using a parasitic nematode, Steinernema scaperisci. In addition, ground beetles are a beneficial predator of mole crickets.